By integrating the back-expert care of physicians, nurses, and physical therapists, the Back Works guide is a regimen of vertebral treatments that provide the necessary care and instruction that lead to a healthy, pain-free back. If you've ever had a back attack that took your breath away and laid you up for days or weeks, you may never have to repeat that painful experience again. As a spine care specialist, Dr. Gray reveals the medical methods that will turn pain into power, stiffness into strength and aching into action! Timothy J. Gray, D.O., medical director of Spinecare of the Pacific and former medical arbiter to the Oregon State Insurance Commission, has treated more than 3,000 back-injured patients in his Forest Grove, Oregon private practice. 4. 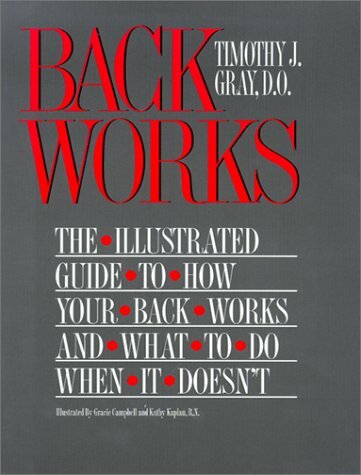 Backworks: The Illustrated Guide to How Your Back Works and What to Do When It Doesn't [Hardcover] Gray, Timothy J.